Howard is a master of gravlax. For many years, it’s been his signature appetizer for special parties. With French Fridays with Dorie’s gravlax on the schedule, we decided it was time for a throwdown challenge. I’ll admit to not doing any of the cooking. I was in charge of the shopping for this one. It’s not that I had anything against the recipe, but wanted an equally experienced touch for a better comparison of the two recipes. I bought a large side of salmon, about 3½ pounds. We cut it in half crosswise and Howard made each half with a different recipe. 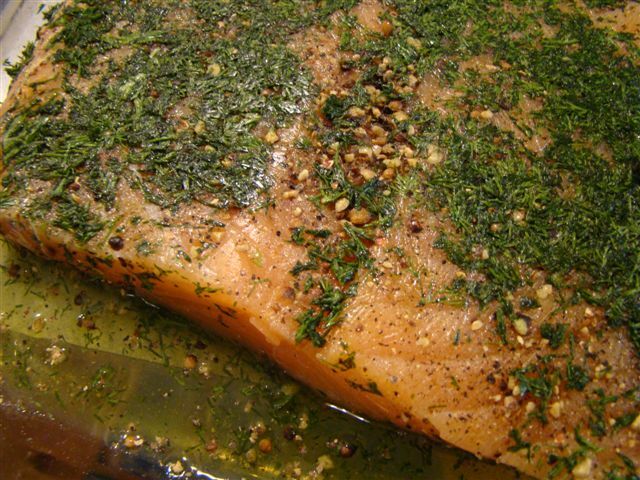 The basic process for gravlax is to coat the fish with herbs and a sugar/salt curing mixture and leave it, pressed under weight (i.e. cans), in the refrigerator for 2-3 days. 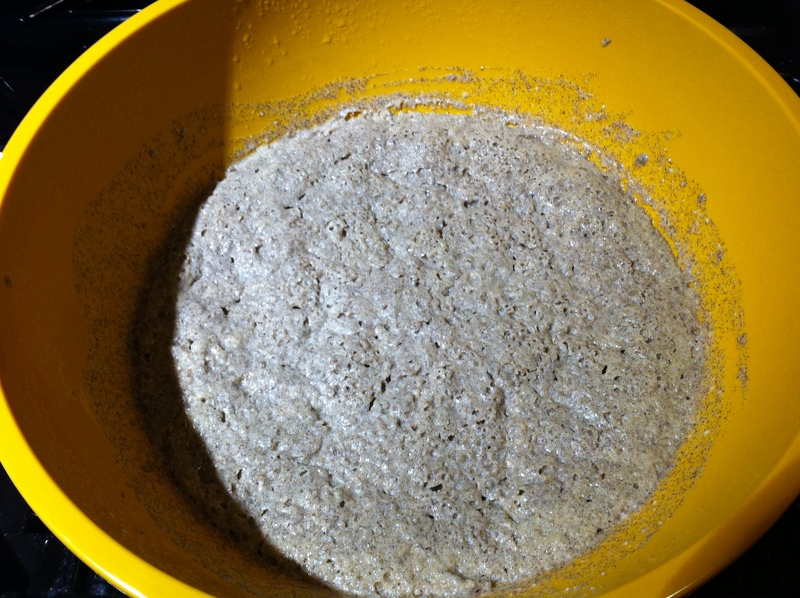 During its cold rest, the rub draws moisture out of the fish, curing (cold cooking) it. The first difference between the two recipes is the flavoring. Dorie adds black and white peppercorns plus coriander seeds to the rub. Howard only adds white peppercorns to his dry mixture, though he rubs the fish with some aromatic liquor first. This time he used Pernod, but aquavit is good too. The main difference is the proportions of sugar and salt in the curing mixture and the total amount of dry rub used. Dorie uses a 3:1 ratio (yes, I’m a math geek) of salt to sugar, and the total amount of rub is just a few tablespoons. Howard uses the opposite: a 2:1 ratio of sugar to salt, and the total amount is a little over two cups. As I said, this is Howard’s signature appetizer for special parties, and we had the perfect occasion. Every year, we celebrate Christmas Eve with longtime friends who make the traditional celebratory Feast of Seven Fishes. All the guests bring contribute dishes to for the meal. This year, the game plan was to start with an abundant appetizer extravaganza accompanied by a festive punch and other drinks. We brought both styles of gravlax for a broad tasting. 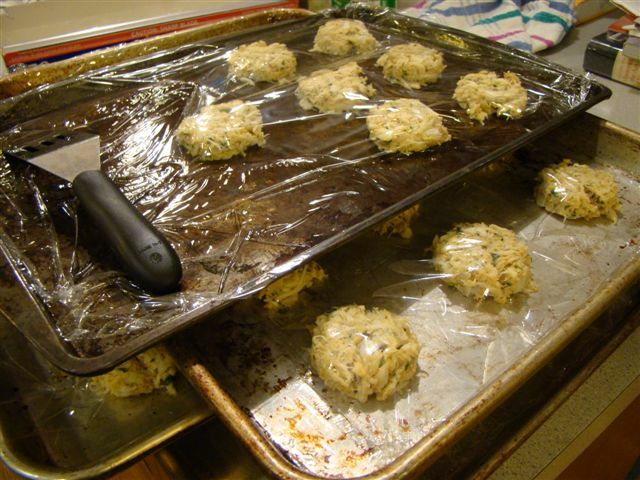 (I made mini-crab cakes.) Later in the evening, we sat at the table to enjoy a delicious Niçoise salad, followed by bourride, a French fish stew heavily laced with aioli. Dessert is an array of home-baked cookies, just the right size to fit into any empty parts of your belly. As always, it was a fantastic meal, one we look forward to all year! 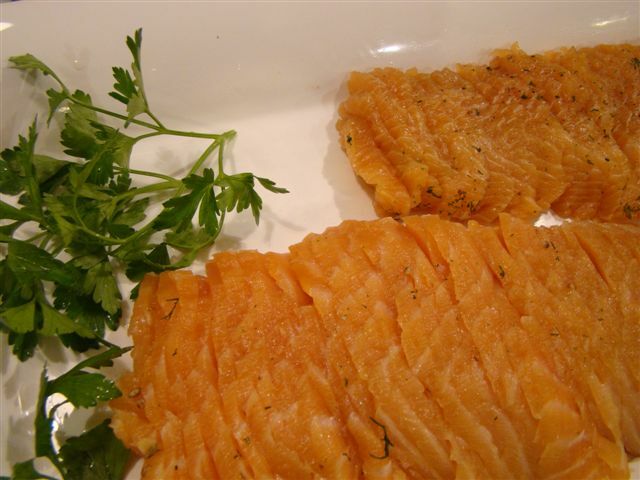 The two styles of gravlax had similar texture and were both delicious. Howard’s “original” version gave off considerably more liquid during the curing process and was firmer than the one prepared Dorie’s way. Dorie’s version was also a little harder to slice thin, probably because it wasn’t quite as firm. We brought half of each half to the party, and there was very little leftover. Both were quite popular with everyone. We’ve been enjoying the salmon we kept for ourselves on bagels with cream cheese in the mornings for the past few days. What a treat! So, what’s the verdict? I’d say that if we’d never made gravlax before, this recipe would become a standard in our repertoire. However, it isn’t different enough than Howard’s usual recipe, so that recipe won’t get displaced. The recipe is definitely a good one, so I urge you to try it if you’ve never made gravlax before. Dorie gives a recipe for a dilly mustard sauce to accompany the fish (which I forgot to take a picture of). We didn’t do a side-by-side comparison of her sauce to our usual. Dorie’s was similar and equally delicious. Her recipe uses using much less oil that the other, so it’s healthier. While the gravlax recipe wasn’t different enough to mandate a switch in the future, her sauce is a new keeper. You can find the recipe for both the gravlax and the sauce in Dorie Greenspan’s book Around My French Table. It’s also on-line at Epicurious. You can also read about other Dorista bloggers’ gravlax by following their links here. In case this is my last post of the year (though that isn’t my plan), I wish you all a Happy New Year! May the year ahead be filled with love and laughter, and of course, good food! I’m looking forward to sharing many more kitchen adventures in 2014. 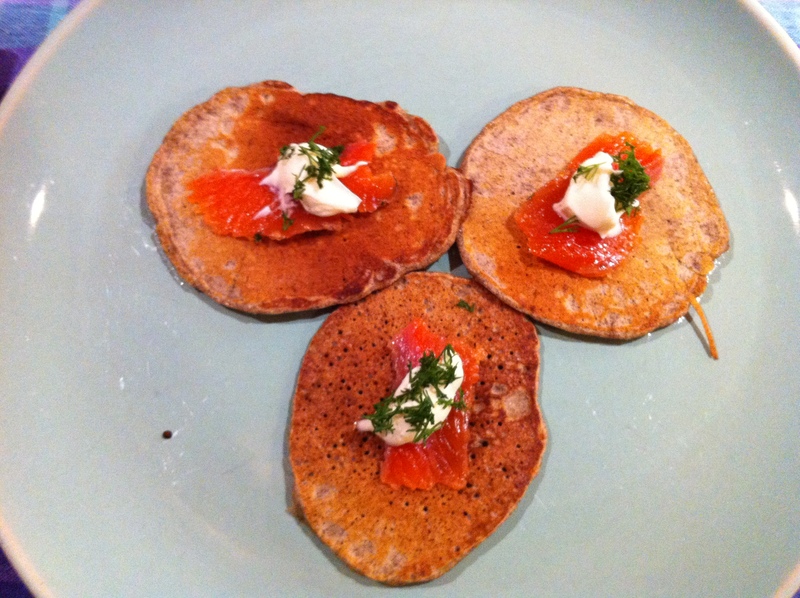 This week’s recipe for the cooking group was Buckwheat Blini with Smoked Salmon and Crème Fraîche. This one could go in one of two directions: appetizer or brunch entrée. I planned ahead and convinced my husband Howard to make gravlax. He’s been doing it for years and it always comes out perfectly. We bought half of a wild Alaskan salmon, ate some for dinner, and he cured the rest. A few days later the salmon was ready. I had the best of intentions of making my own crème fraîche, but my forethought didn’t extend to myself. Typical. 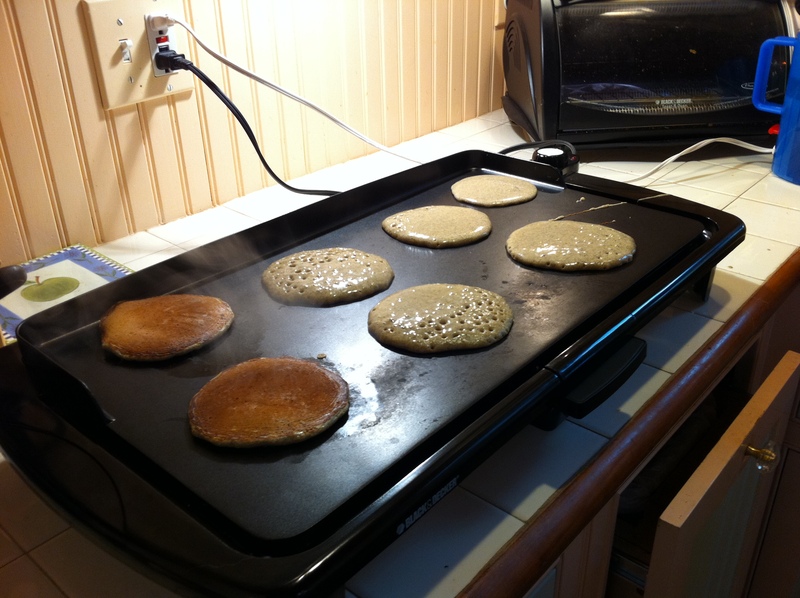 The blini are made from a yeasted buckwheat batter. It needs to sit for at least 60 to 90 minutes to get the rising action going. Since I chose to try this for brunch, I made the batter the night before, letting it sit out for 90 minutes at room temperature, then stashed it in the refrigerator for the night. I was a little worried because my foil packet of yeast didn’t quite measure the 2 teaspoons called for in the recipe, but I had major bubble action, so it was fine. In the morning, we made lots of little pancakes. Each pancake was dolloped with crème fraîche, topped with a slice of gravlax, and sprinkled with some dill. (I forgot to look for salmon roe, which would have been a nice addition.) They made a lovely presentation. We thought the blini would make a better appetizer than brunch. First of all, it felt more natural to eat with your fingers than a fork, which seems more like an appetizer. Then, to fill up, you would need to eat a lot of blini, so again, it seemed like a better appetizer. Finally, I think the earthy, tangy taste of the blinis themselves were such a contrast to buttermilk breakfast pancakes that they suffered by the comparison. They would have shined as an appetizer. Conclusion: I liked this dish, but served it for the wrong meal. I’m also excited to be able to experiment with the rest of the bag of buckwheat flour. I found a nice selection of recipes to try on Heidi Swanson’s 101 Cookbooks blog. The figgy buckwheat scones look especially appealing. This link will give my search results. For the cooking group, we don’t publish the recipes. For that, you’ll need to check out Dorie Greenspan’s book Around My French Table. You won’t be sorry. What did the other FFwD bloggers think of the blini? You can see their links here and find out for yourself. Next week, something I’ve wanted to try for a long time: Pissaladière!